Sean Rafferty's guests include tenor Nicolas Mulroy with the English Cornett and Sackbutt Ensemble, violinist Emily Sun, and director Charles Edwards. Sean Rafferty with a lively mix of chat, arts news and live performance. 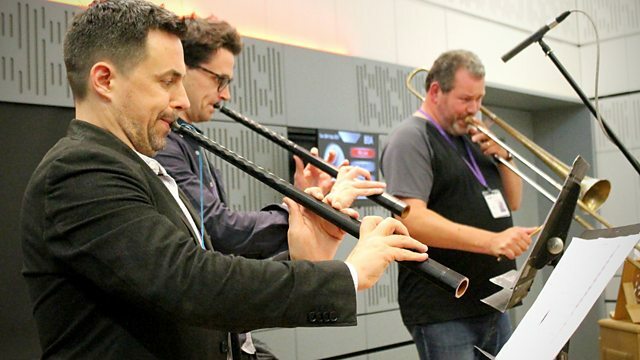 Sean's guests include Nicolas Mulroy with the English Cornett and Sackbutt Ensemble ahead of Tetbury Music Festival, BBC Music Introducing Artist Emily Sun, who performs in the studio with Sam Armstrong before their performance at Bridgewater Hall. Charles Edwards and Giselle Allen join us down the line from Leeds to talk about Opera North's Little Greats season. Orchestra: Orchestre de Paris. Conductor: Semyon Bychkov. Performer: Nicholas Mulroy. Ensemble: The English Cornett and Sackbut Ensemble. Orchestra: Orchestra of La Scala, Milan. Conductor: Herbert von Karajan. Orchestra: London Symphony Orchestra. Conductor: Jean Martinon. Orchestra: Orchestra of Welsh National Opera. Conductor: Charles Mackerras. Orchestra: Orchestra of the Academy of Santa Cecilia, Rome. Conductor: Lamberto Gardelli. Performer: James Ehnes. Orchestra: Sydney Symphony Orchestra. Conductor: Vladimir Ashkenazy. Ensemble: La Nuova Musica. Director: David Bates. Handel/Vivaldi: Dixit Dominus: La Nuova Musica/Bates. Couperin: Keyboard Music 1: Angela Hewitt. Orchestra: Vienna Philharmonic. Conductor: Christoph von Dohnányi. Mendelssohn: Symphonies Nos.3 - 5; THe Hebrides, etc. - Wiener Philharmoniker, D.
Performer: Emily Sun. Performer: Sam Armstrong.